The Peugeot bicycle leaned against the moss covered shed. Its owner stood behind me as I brushed a decade worth of leaves and pine needles off the frame. “I don’t know if it even still works,” she said. That was an understatement. Orange rust speckled the frame and chrome. One wheel was detached and lay forlornly on the damp earth. The tires were nothing but bare wire: probably the same set that came with it 40 years ago. The brake cables had fused with their housings. They would have to be cut. I asked what she wanted for it. “A hundred,” she said. It was a Hail Mary offer. “Nope,” I said, “Fourty, max.” I pointed out various disintegrating components. We agreed on sixty. As I loaded it up, I smiled. After a haircut and a shave, I’d resell this beautiful bike for $150, easily. She saw junk, but I saw potential. How do we distinguish between the rust bucket and the hidden gem? How do you determine if a vintage bike project is ‘too far gone’? I think it’s safe to say that vintage bicycles have never been more popular than they are today. It seems like every other rider in my city has a gorgeous, tastefully restored vintage bike. The wonderful thing about a bicycle is that it’s a long term investment. With a metal frame and solid construction, a bike is (typically) built to last a long time. With care and attention, any quality bicycle can outlive you. Your kids will fight over it! I’ve been buying, restoring and flipping vintage bicycles for a number of years. It’s incredibly rewarding and satisfying. The image featured above is the bike from my story. I wish I had thought to take a ‘before’ photo. I repaired it to good condition and sold it for $160 the next week. Not bad for a few hours of hobby time! If you get into any vintage bicycle restoration project, go in with your eyes open. It will be a lot of work! Removing rust, replacing components, there’s a lot to do. But the rewards are great, and anyone can acquire the skills. Here’s some tips on how to do it. There are a few things that can make or break a vintage bicycle project. The key is to identify a dud before you buy it. Here are a few things to keep your eyes open for when buying a vintage bike. As you probably know, rust is a big deal. It’s probably the first thing you’ll notice. But here’s the thing: all steel rusts, given enough time. If you’re buying a vintage bike, you’re likely going to run into some rust in one form or another. There’s a big difference between the kind of rust that will ruin a bike, and the stuff that you can clean up. The trick is learning the difference. Fixable rust is purely cosmetic. It hasn’t eaten through the frame, the components or the chrome. It’s on the surface, not in the structure. 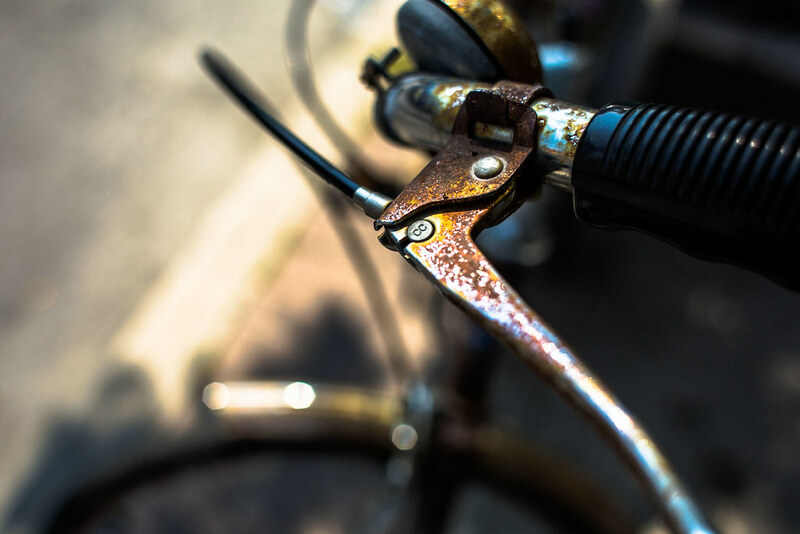 A great way to determine the extent of rust is by gently tapping any prospective project bicycle to see if any of the metal starts to crumble. Crumbling metal is bad news! Chrome looks great, but unfortunately it’s also rather prone to cosmetic rust. Here’s some good news: most rusted chrome can be restored to a near-new finish. A bit of fine steel wool or crumpled aluminum foil will usually clean surface oxidization off of any chrome and make it shine like new! If the bike you’re inspecting has shiny chrome with a speckling of rust, it’s a safe bet. If you can’t see much of the chrome underneath, give it a pass. This most likely means that it’s damaged beyond repair. The green road bike in the main photo was found with lots of surface rust. However, the metal underneath was strong, and the rust on the frame was merely cosmetic. It cleaned up nicely. By contrast, the picture above shows rust that I’d consider beyond repair, particularly on the brake lever. The oxidization is pronounced and, while the lever probably still functions, it will never look like new again. Which is fine! It’s just good to know what’s fixable and what isn’t. With any vintage bicycle restoration, this is the biggie. Bike parts wear out under regular usage. They’re designed to. The indicators are based on a regular amount of use. However, those indicators are not designed to warn you about old age. Let’s look at my green Peugeot again. The bicycle wasn’t really used that much, so the brake and shifter cables weren’t stretched. The brake pads were barely touched. All of the traditional indicators seemed to suggest that this bike was almost ready to ride! Of course, that wasn’t true. The cables were fused. Even if they weren’t fused, they were brittle. The brake pads were hard as a rock and worthless for stopping. The tire rubber had disintegrated due to age and the elements. With any classic bicycle restoration project, I’d highly recommend you replace all replaceable parts. In a nutshell, that means tires, tubes, cables, brake pads and the chain. As funny as it sounds, most people don’t know that these parts wear out! The chain, in particular, seems to get used for way longer than it should. Ineffective old parts hinder your ability to ride and stop safely. In some cases they’ll even wear out your bike (a bad chain, for example). 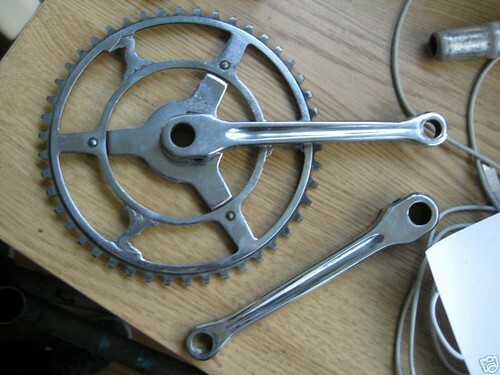 Here’s something to think about when restoring a vintage bicycle: components aren’t always easy to find. You can often find something that’s close to the original, but older bikes are hard to source parts for. Rare bikes are even tougher, particularly foreign models. Most big cities will have a used bike parts store of one kind or another. If not, eBay is your friend. If you’re not attempting to create an exact replica, I’d encourage you to find similar but modern replacement parts that work better than the originals. Once you have selected a project bike, it can be daunting to figure out where to start. Here are some tips to get you rolling. 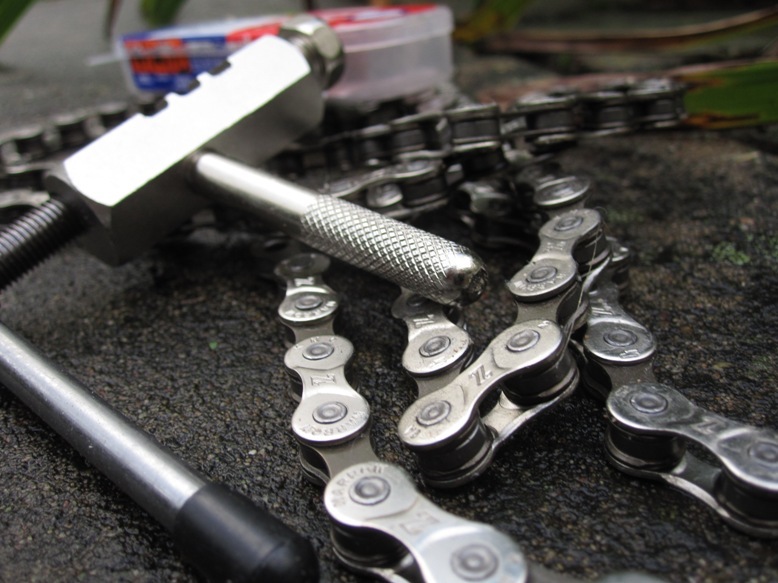 Remove the chain, cables, cable housings, tubes, tires and brake pads, as necessary. I typically replace ALL of these as a rule, but use your best judgement. Replace them all. Make sure the chain is the right length, and run the cables properly. Do all this BEFORE replacing any components. Why? Because we’re reverse troubleshooting. You can best diagnose component issues if you’re certain that worn out parts are not the cause. Go through all the bicycle components one by one to assess working order. Brakes, shifters, front and rear derailleurs. Look for rust and wear. If a component isn’t working properly, see if a bit of lubrication can help. Use a wire brush to remove surface rust. If the component still doesn’t work properly after some TLC, carefully remove it and give it an inspection. If it seems beyond fixing, take it to your local bike shop and start the hunt for a replacement part. Save the cosmetic stuff for last. It might be tempting to start removing surface rust and repaint right away, but I’d caution you against it. Why? Because if you spend a bunch of time making the bike beautiful and then find out it’s beyond repair mechanically, you’ve just wasted a bunch of time. As mentioned, light steel wool is a fantastic way to remove surface rust on chrome and make it shine like new. It’s a lot of elbow grease, but seeing that shine come back is super rewarding. If it’s not super effective, try a different weight of wool. If you’re planning to repaint your frame, strip all the components off of it. Everything. Sand it down to the bare metal, give it a coat of primer and then start painting. (The paint process is complex, and I’ll write a whole article on the subject later on). When you’re done, it’s really worth going over every nut and bolt on your bicycle to make sure it’s tight. When you’re taking it all apart and putting it back together again, it’s easy to neglect one little bolt. I’ll admit, I once hopped on a freshly restored bicycle and discovered (several blocks down the road) that I hadn’t tightened the handlebars. At all. So double check! I’ve walked through a bunch of stuff here, but there’s no way I can cover it all. Restoring a vintage bicycle to perfect condition is an exercise in frustration. You will swear. You will hurl tools. It’s worth it. A couple final bits of advice: make use of your local resources (shops, hobby clubs, etc). 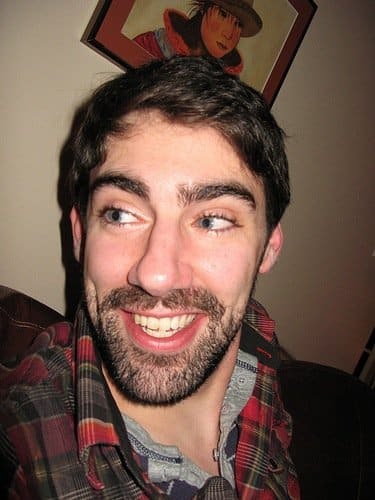 Use online resources and read up on how to do things (the late, great Sheldon Brown was and still is a wonderful resource on vintage bicycle stuff). And finally, take breaks. If you’ve been working on something for 20 minutes without success, go crack a beer or have a snack. It’s amazing what a little time and space can do. I’ve written a companion piece with practical tips on what to replace. Check it out? 920 Will you restore my restore my circa 1920 25″ wood rim rear wheal? I get the point about the earlier poster’s about the lack of economic sense of a 60 buy & 160 sell after so much effort… but it doesn’t stop me either. Something very satisfying about taking an old unwanted bike and making it better than new. We have a girls 16 inch “the world” with all original parts in good condition. Looking for someone to restore my 1965 Stingray in the Colorado area. Please advise. I tore down a shed on my wife’s mother property and in it was a vintage JC Higgins bicycle that my wife rode 70 years ago. I think it can be restored but I’m not capable of doing it. Is there anybody in the Western Chicago area that does bike restorations? Where do you go to sell your bikes? I have my Raleigh Grand Prix from the 70’s I would love to fix up and sell but do not know where to start. Or even if it is worth it. So you bought it for 60, say you can sell it for $160. Ok.. let’s say you managed to fix it up for $30 using some cheap dumpster dived parts. Then you made $70. And including the time hauling it home this certainly took the better part of a day. I wouldn’t be bragging about seeing the hidden economic value in that that she didn’t? If you like doing it, that’s a different story, but I think she got a good deal selling that for $60. I probably invested two hours in the project: pick up bike, drop by parts shop, repairs took around 1 hour, so I was happy with the time invested to profit ratio. That said, it’s a hobby, not a big money maker. I enjoyed giving the bike a second chance at life. And you’re right, $60 was probably a great deal for her too. Win win! I have just been given a Peugeot folding bicycle, where can I find some info, I’m not having any luck, it looks VERY OLD but for the OLD part it seems to be in good condition. Any help is appreciated! Hi Peter, yeah those old 3-speeds can be tricky! They don’t make them anymore, as far as I know. I’ve had good luck with eBay for finding parts. Otherwise, another shifter could work (Shimano, for example). Check out Bike-Forums dot net, it’s a fantastic collection of bike hobbyists and a great resource for this sort of thing. Whats the best all around road bike \ swiss army knife bike for under or around 1200? I prefer Italian but am open to others. Hi Jest… oh gosh, tough question, so many factors! Primarily road? The Cannondale Synapse 105 perhaps? The Giant Revolt is a really interesting and versatile bike. Maybe check out our article on cyclocross bikes? That’s about as swiss army as I know! You can find it here. Hope that helps!